Every two years, athletes reach the culmination of a lifetime of hard work in their attempts to bring home hardware for their country. 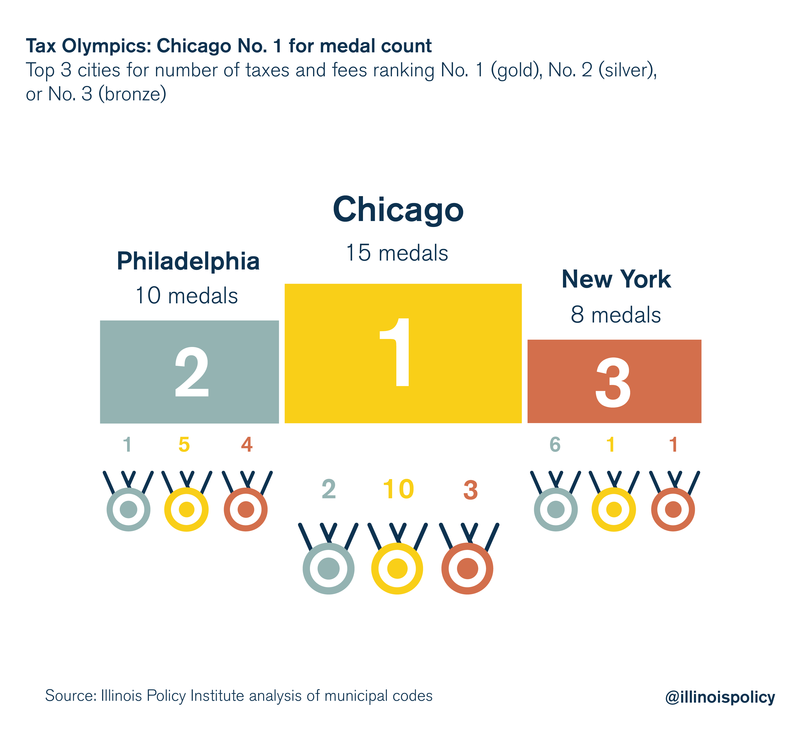 Meanwhile, politicians in Chicago have been working for years to increase the “medal count” for the city when it comes to taxes and fees, and the results are in. Compared with the top 15 cities in the nation, Chicago takes home more gold than all of them. After analyzing 24 different taxes and fees – from those on cellphones, cigarettes, ridesharing and more – Chicago is leaps and bounds ahead of its competitors, with 10 No. 1 rankings. Philadelphia comes in second with five No. 1 rankings and San Jose in third with three. 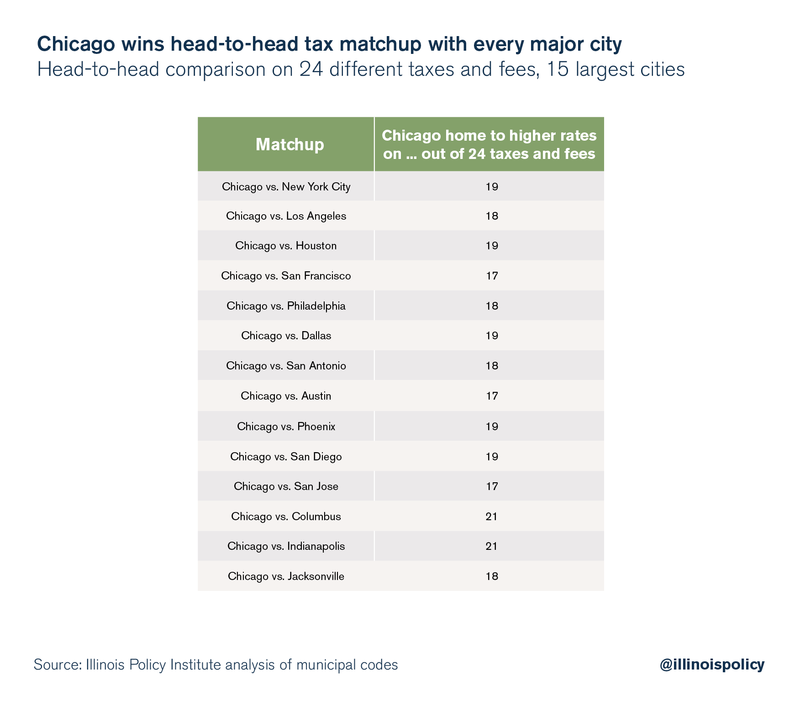 Additionally, Chicago ranks in the top half of the nation’s largest cities on 19 out of the 24 taxes and fees measured. New York and San Francisco tied for second with 13 a piece. It’s not just gold medals that Chicago is racking up. In addition to the 10 gold medals, the city earned two silver medals and three bronze medals. Chicagoans make less, but are taxed more. When adjusted for cost of living, Chicagoans have an average income of $50,675, ranking eight out of the 15 largest cities. 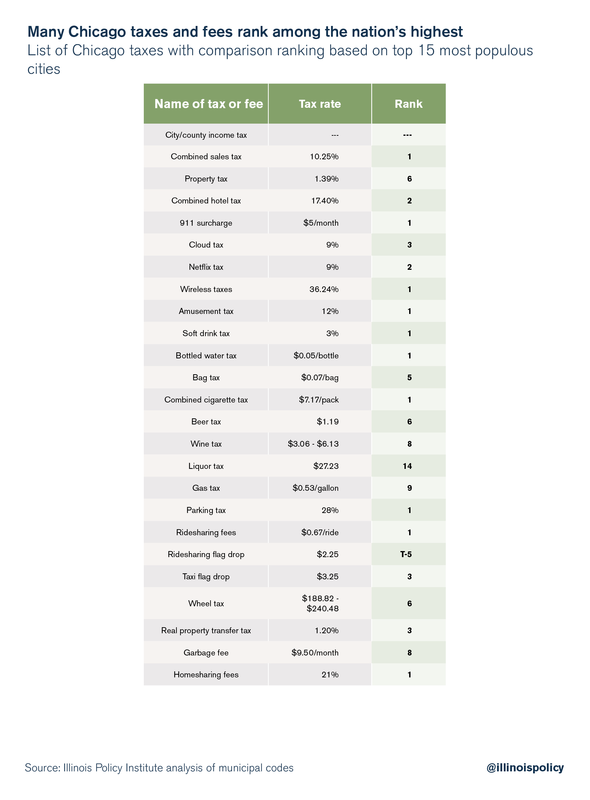 Chicago levies the highest statutory tax rate on 10 of the 24 “everyday” taxes and fees. An everyday tax or fee is defined as a tax or fee levied on taxpayers by their local government on a good or service that is used on a regular basis. This includes the sales tax, 911 surcharge, amusement tax, bottled water tax, cigarette tax, ridesharing tax and homesharing tax. Less well-known, but still “everyday” taxes include the soft drink tax and parking tax. The soft drink tax has been levied on retail soda purchases since the early 1990s. This is a 3 percent tax on the retail sale of soft drinks, including vending machines. Compared to the anger over the similar Cook County soda tax, this tax continues to persist with little scrutiny. Similarly, Chicagoans are hit hard by parking taxes. Those drivers seeking rates lower than the parking meters are unlikely to find them at city parking garages, where the combined tax rate is as high as 28 percent. That doesn’t include the wheel tax, which increased Feb. 1, 2018, or the gas tax. Neither is at the top of the city comparison list, but both add additional pain for the taxpayer. Chicagoans know there is a high tax burden in the city but few know exactly how high. Comparing Chicago to each of the other top 15 cities shows just how painful it can be. The statutory rate of tax, or the percentage dictated by law, is higher in Chicago than it is in New York City on 19 of the 24 taxes measured. The Midwestern cities of Indianapolis and Columbus are home to lower rates on 21 of the 24 taxes. While it’s true that these cities have a city/county-level income tax, look to Houston. The fourth largest city in the country doesn’t have a local income tax and has lower rates on 19 of the 24 taxes. With each passing year, the Chicago City Council has found innovative ways to increase the tax burden on Chicagoans. At the same time, Chicago and Cook County are experiencing heavy population loss. The city should rebuff any attempts to increase an already exorbitant and ever-growing burden of taxes and fees. That this burden is so big is thanks, in part, to Chicago’s ever-growing pension obligations and constant budget crises. From the nation’s highest wireless taxes, to taxes on streaming services such as Netflix and Spotify, to a garbage collection fee – not to mention a record-breaking property tax increase and the highest sales tax rate of any major city in the nation – residents are tapped out and have started to express their anger. Instead of nickel and diming Chicagoans, the city should be looking at reforms such as introducing a 401(k)-style alternative to failing city pension funds, addressing city spending, and eliminating tax increment financing districts. Until true reforms are enacted, the city will continue to be the undisputed champion of taxes. The basis for the majority of figures in this report comes from the municipal codes of the top 15 most populous cities in the country. Where statutory rates weren’t available, the Illinois Policy Institute submitted requests from industry organizations. All of these tax rates are statutory with the exception of property taxes. Due to the complex nature of the property tax formula, the effective tax rate was found by taking total taxes paid as a portion of total housing value. Not every city levies each of one of the 24 taxes measured. In that instance, the cities that do levy the tax are ranked. In order to provide the full picture of what the local consumer pays, the sales tax, hotel tax, amusement tax and parking tax are each calculated using combined city, county and state rates.